The following items were uploaded. A new “Welcome movie” was added on YouTube. “Information on the Web” was also updated. JSAE has decided to extend the abstract submission deadline to Feb. 28, 2019, considering some requests of an extension. We would like to encourage as many researchers and students as possible to participate in this important conference. Please check out helpful information on this website. Outlines of Conference Fees & Technical Visits are uploaded. 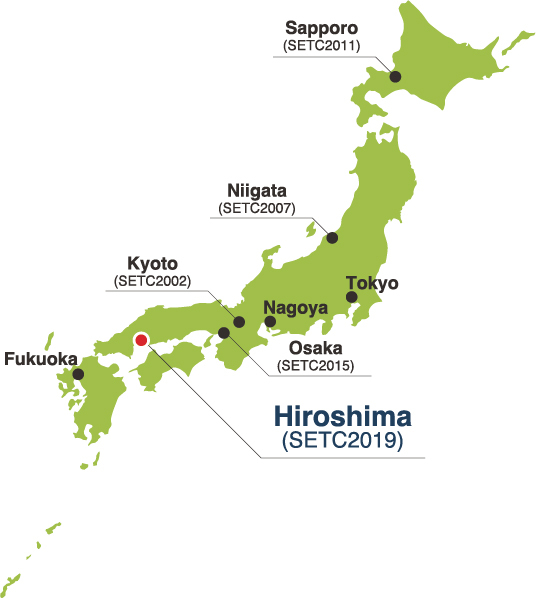 Society of Automotive Engineers of Japan Inc. (JSAE) announces that the 25th Small Engine Technology Conference (SETC) will be held at International Conference Center Hiroshima, Japan, from 19th through 21st of November, 2019. 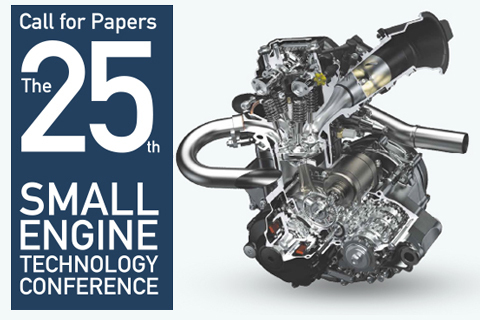 The conference is jointly sponsored by JSAE and SAE International, and is supported by Japan Land Engine Manufacturers Association (LEMA). JSAE would like to encourage researchers and engineers of technical fields intended for the conference to submit draft papers. In addition, participants from various fields and interests are invited to the conference to exchange innovative ideas. This networking opportunity contributes to sharing knowledge and information with key persons of the technological fields. The keynote speeches and the plenary session expand your scope of expertise together with the exhibition and the technical visit. Linked with these technical activities, posters from academia are also presented to show the progressions in various research fields. Vehicles with motor such as ATV, Motorcycle, Scooter, Personal Mobility Vehicle, Watercraft, Outboard motor, Snowmobile, Recreational Vehicle, Utility Vehicle, Power Assist Device, Assisted Bicycle and Unmanned Vehicle. Machineries with motor such as Snow Plow/Blower, Portable Power Generator, Agricultural Machine, Gardening Apparatuses, Hand Tools and Powered Exoskeleton, Small and Micro Combined Heat and Power Systems. Technologies applicable for the products above are to be presented. Please be sure Automobiles, Large Vessels, Large Aircraft, Locomotives and Spaceships are out of the subject. Combustion Engines such as 4 stroke Engine, 2 stroke Engine, Spark Ignition Engine, Diesel Engine, HCCI Engine, Unconventional Engine and Competition Engine. New Energy Sources such as Hybrid Drive, Electric Drive, Fuel Cells and Solar Cells. Components such as Chassis, Suspensions, Brakes, Transmissions, Drivetrains, Electrical Systems, Electronic Systems, Fuel Supply Systems and Wheels & Tires. Development Technologies such as Numerical Simulations, Model Based Development (MBD), Measurements and Production Technologies. Fuels, Lubricants and Tribology such as Alternative Fuels, Fuel Reformations, Additives, Friction Loss and Wear. Vehicle Technologies such as Dynamics, Drivability, Safety Technology, Functional Safety and Human Factors & Ergonomics. Environmental Impacts such as Noise, Vibration, Emissions, Fuel Efficiency, After-treatment and Life Cycle Management & Recyclability. No simultaneous interpretation will be provided. We kindly ask prospective researchers and engineers in a diversified field of technologies and products with power source to submit electronic abstracts of 300 to 500 words on-line via SETC website (URL: http://www.setc-jsae.com/) linked to JSAE Paper Entry System. You will receive a reply upon your submission. The paper should be written and presented at the conference, which should be applications oriented. No paper will be accepted without a presentation. The paper should be described using hard metric (SI) units. Material of a purely product introductive nature or containing commercialism should be omitted. Final manuscripts should make a contribution to the state-of-the-art technology or present a comprehensive review, be of high technical quality with conclusions supported by technical data. A presenting author, when his/her final manuscript is accepted, is asked to make on-line advanced registration via SETC website linked to the registration system. A presenting author should bring his/her own PC for presentation to the venue. Excellent papers and presentations will be awarded prizes. Your technical paper could be eligible for SAE Journal if qualified. OEMs, suppliers and academia will be given an opportunity to exhibit their products and technical information during the conference at the venue. Poster session in conjunction with technical session will be also provided to graduate and undergraduate university students, and their researchers. Excellent poster will be awarded a prize. The chance to post your company's advertisement banner and/or advertisement on the preliminary and the final program will be offered. Furthermore, conference sponsorship program for the Welcome Reception and other events will be planned. Information will be available at the SETC website in the autumn of 2018. Hiroshima is a beautiful city blessed with a rich natural environment, nestled between lush green mountains and the tranquil Seto Inland Sea, with six rivers flowing through its center. 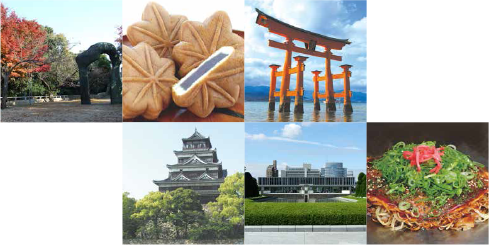 For beautiful city landscapes that coexist harmoniously with nature, look no further than Hiroshima! UNESCO World Heritage Site "ITSUKUSHIMA SHINTO SHRINE"
Hiroshima Delicacy "OKONOMIYAKI" & "OYSTERS"